Traditional influence has followed a systematic top-down process of developing and pushing “controlled” messages to audiences for decades, rooted in one-to-many, faceless broadcast campaigns. Personality wasn’t absent in certain mediums, it was missing from day-to-day communications. For the most part, this pattern seemingly served its purposes, fueling the belief that brands were in control of their messages, from delivery to dissemination, among the demographics to which they were targeted. Unbeknown to many companies, a quiet revolution was amassing over the last two decades. And, slowly but surely, the whispers eventually intensified into roars. The socialization of the Web and content publishing disrupted the balance and is now forcing a media renaissance that is transforming information distribution, human interaction and everything that orbits this nascent ecosystem. It is the dawn of a democratized information economy, which is engendering the emergence of champions and visionaries who endeavor to manifest a more media literate society while transforming the way we publish and share relevant content. The Social Web heralded the arrival of mainstream consumer influence and a global ecosystem that supports and extends their observations, complaints, opinions, and recommendations. It served as a great equalizer, capsizing the existing balance and redistributing influence. Not only is it changing how we create, decipher, and share information, but also it is forever reshaping how brands and content publishers think about their markets and the people who define them. We the people demanded personalization in engagement, improved services that put the customer back into the spotlight, and acknowledgment that our feedback would incite a more value-added circle of overall communications and product adaptation. Although there were numerous, sensational attempts to silence us through the misdirection and suppression of critical yet ignored or unheard experiences, insights and feedback, we have emerged influential and consequential to the bottom lines of businesses all over the world. As consumers, we fervently stormed these new platforms and staged a social revolution that forced the attention of those who so readily dismissed us – silence was no longer golden. Social networks and platforms have transcended the role of the consumer from customer to authority, ambassador and critic. Those who master their domains are developing persuasive and important communities around their areas of expertise, interests and passions and now possess the prowess and authority to direct, instruct, and steer decision makers and referrers. Aside from the disciplines and behavior our profession dictates, we are far more than communicators, marketers, publishers or chroniclers of life events. We are also knowledgeable people with ideas, opinions, observations, and experiences that cannot be discounted. We bring opinions, experiences, rapture, and frustrations to each conversation as a consumer. But when its time to reach our peers and colleagues, we regress to broadcasters and purveyors of information and lose site of how what we represent truly impacts those we’re trying to reach. We essentially lose perspective and personification. In the end, we earn the influence that our activities and shared experiences justify and warrant. Our presence and participation impacts the decisions and impressions of those around us. We connect people to products and services and ultimately assist in the governance of future actions among those within our immediate social graph as well as the graphs that link our friends, their friends and also the friends of friends (FoFs) network. As a brand manager and also as someone who’s responsible for extending the company’s products and value propositions to the marketplace and building meaningful communities and relationships, I personally welcome you to a new genre of distributed influence, one where we must earn authority on both sides of the conversation – as representatives and consumers. We are the people we’re trying to reach. We’re paying attention to a-list bloggers, from technologists to moms to lifestyle to politics and everything in between and forgetting or ignoring the magic middle, those bloggers who actually inform and interact prospective customers. We’re blindly jumping into social networks and engaging with the “avatars” tied to keywords instead of identifying and recruiting those who can help us create valuable, thriving communities that support the exchange of pertinent information. Tastemakers and trendsetters are the new influencers, but their roles in affecting consumer behavior are not derivative of the Social Web. Instead, these tastemakers and trendsetters who individually contribute to a more influential public are now readily discoverable courtesy of the search boxes and APIs that facilitate their recognition within the communities of consequence. Social Networks, blogs, microblogs, and all other forms of people-powered platforms provide a looking glass into the interaction between consumers and also the ability to discern the level of authority each one possesses. While that’s true, they also spend money on products that help them do something that they couldn’t do before based on existing needs and desires or frustrations with current experiences. Therefore people are looking for answers, not necessarily friends. They’re seeking societies where they can learn, share, and contribute. And they’re using the tools, channels, and networks to connect with one another. Listening counts for everything nowadays and it’s by and far the easiest step in embracing and ultimately leading the transition from an introverted organization into an extroverted, community-focused human network. It sets the foundation to not only listen and respond on the front lines, but also it necessitates the modification of the entire infrastructure to adapt to the real world needs of customers and the insights they choose to share. This is a privilege and an opportunity. It’s the shift from top > down broadcasting to a more holistic methodology that embraces consumers directly using the tools and channels they use to communicate. In order to build a bridge between brand and markets requires the personification of the company and it’s ability to not only humanize its story, but also listen and respond to input and dialogue through words and the adaptation of products and services. Influential customers collectively create a network of information beacons that help others successfully navigate within their respective markets and industries. We’re awakening to a new era of stature and authority that augments broadcast communications with the participatory groundswell of user-generated leverage and impact. In the world of Social Media, brands can also earn influence using the same tools and networks that have empowered bloggers and tastemakers alike. So how do you establish a D2C program that tunes into inbound feedback, fosters relationships, and creates a foundation for material evolution? How do you identify these beacons and genuinely approach them to potentially establish a collaborative engagement? Authoritative customers and bloggers are noticeably absent from mainstay databases and systems that have long helped marketing and public relations identify traditionally influential voices. The systems and algorithms required to accurately identify conversations and the people who fuel their public development. Most of this “real time” technology that is facilitating potentially prominent conversations and also the ability to discover them is just now demonstrating promise and proving value. Since everything starts with systematic listening, we can’t sit and wait for existing applications and solutions to acclimate to the dynamic of our business and supporting markets. We need to identify and embrace the tools that help us find out who’s important to us right now. And here’s the good news, most of them are free. Actually listening, hearing, and internalizing the words of others inherently qualifies someone as worthy of engagement. Interaction, however, is measured by the exchanges that further the development and direction of the hosts of the original conversations as well as those who were peripherally observing and affected. Tastemakers and those who’ve earned the ears and eyes of their peers are either dubious of corporate outreach or opportunistic in assessing the overall potential. Your approach counts for everything. And, this is not – at least for the purposes of this discussion – about buying or leasing the outcome of the interaction. Those who pay attention to the dynamics, intricacies and psyche of the words, tone, and nature of the dialogue can make the difference between simply responding, reconciliation, and resolution. But please take note, if the process of listening and responding was relegated to simply searching keywords and responding to specific instances, “by the book,” this currently coveted role quickly downgrades to the general ranks of basic conversational competence. Conversation is simply conversation, regardless of tools. The qualifications to maintain dialogue are trivial. The true question is what is it that we’re trying to accomplish as the task of simply showing up to the table is honestly, child’s play. When discussing social media and participatory protocol, let’s no longer share the examples of standing on top of a table during a cocktail party and obnoxiously yelling out messages at the crowd. Honestly, this is an example social etiquette, not strategic social listening and engagement. We need to be acutely informed, open, and enlightened individuals who can engage at both an empathetic and genuine position. The type of listening I’m referring to here, isn’t simply identifying updates or threads tied to keywords to inject canned responses, generic questions or disconnected updates based on the nature of the conversation. Listening requires a dedicated infrastructure and support system; essentially the ability to not just hear something nor placate or acquiesce the emotions and concerns of real people, but the capacity and alacrity to adapt based on the information and insight that’s absorbed. It’s the power of inflection. Who’s responsible for listening? Someone has to take responsibility for the process of listening and channeling conversations. In some cases, a community manager is hired to act as the central hub to all internal departments. 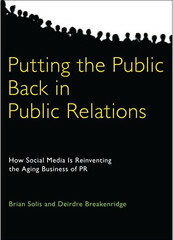 In other cases, PR has taken over the responsibility of listening, reporting, and analysis. In other organizations, the function of monitoring, observing, documenting, reporting, trending, and conversation management is outsourced to an agency that specializes in new media. Depending on the firm, you can expect to pay between $2,500 – $7,500 per month for daily tracking/documentation. It’s this function that serves as one of the most important roles in the transformation of any organization from an inward focus to an outward extension. The intelligence and insight gathered during these exercises tells us everything. Most importantly, it reveals where we need to start and what is actually transpiring in this enthralling and persuasive landscape. It’s where we need to start. It’s how we assess the opportunity. It’s also the only way to gauge the volume, velocity, and resources required to properly interpret, process, and address the situations that require our attention. While jumping into Social Media is a given for some companies, others need to substantiate the effort in order to justify the shift in or creation of dedicated budget and personnel. Before we can discuss ROI, we first need to understand the proportions of the investment required. The distance between perplexity and resolution is disclosed through research and appraisal. There isn’t another way around it. The answers lay in the process of searching keywords and reading, watching, absorbing, and logging the responses you encounter. I’m not suggesting that you’re losing your hearing or your sight. I’m metaphorically referring to the fact that we need assistance in order to hear and see relevant conversations and the related people and communities where they emerge and inhabit. As you’ll see that the list is of tools to identify influencers, unearth and listen to online conversations, and track their paths, relevance, and status, is extensive and the available services and options will only continue to multiply. The ONLY way to understand, truly grasp and appreciate, the tools that are right for you and match the needs of your organization and existing processes and workflow is to endure the undertaking of manually searching for relevant information. Automation is helpful in that it saves time and conserves precious resources, and in some cases, provides us with answers to questions we never new to ask. The systematic procedure for distinguishing, tracking, analyzing, trending, and reporting conversations and would be influencers requires a direct experience in order to understand the differences in results between a hands-on approach and those run through algorithmic software. I know. There are only so many hours in the day and it’s not possible nor scalable or sustainable to do everything alone. However, the truth is, that this is how you learn. This is how your garner perspective. It establishes a benchmark. This is the investment you’re making in yourself, your career, and your future. Just do it. You’ll thank me later. Now, let’s review the tools available so that we can start the process of uncovering the unknown and plotting our next courses of action. Help me keep the list up to date and complete. Please add resources in the comments section. Collecta: Collecta is the first true real-time search engine that monitors not just Twitter but the update streams of news sites, popular blogs and social media sites, including Twitter, Flickr, among many others. Unlike a traditional search engine that displays indexed results and are ranked based on a series of links and ranking, results and trends in Collecta are updated in your search stream are as they happen – as they appear online. Think Twitter Search, but for the entire Web. Google Alerts: Email updates of the latest relevant results for keywords on the Web, blogs, or some indexed social networks. PeopleBrowsr: A dashboard for managing communications across Twitter, Facebook, YouTube, FriendFeed and other social networks. The service also doubles as an integrated search network for each network in connects and the ability to track and manage automated or customer responses to the results for key words – providing an all-inclusive communications management platform. FriendFeed: FriendFeed is a microblog that aggregates content from multiple networks into one, easy to follow collective stream. Friends can follow, comment, share and “like” updates and also spark threaded conversations based on their activity. Since FriendFeed can import updates from multiple properties such as Twitter, Facebook, YouTube, Flickr, Delicious, LinkedIn, and roughly 50 additional services, it provides a highly curated source for curated search. The advanced search feature in FF allows users to search the entire network for keywords that are syndicated through all 58 networks within the community. OneRiot: Formerly Me.dium, OneRiot crawls the links people share on Twitter, Digg, YouTube, and other social sharing services, then indexes the content on those pages instantly. The end result is a search experience that allows users to find fresh, socially-relevant, human curated content. It also displays a link to the person who first shared the item online. Google Query: Expected to launch soon, Google Query will provide the ability to search microblogs similar to how users can search and sort data within Technorati, by date, influence, location, language, etc. Here’s the current description used in Google’s localization service: Recent updates about QUERY. This is the MicroBlogsearch Universal result group header text. A Microblog is a blog with very short entries. Twitter is the popular service associated with this format. Twitter Search: search.twitter.com, oneriot.com, Twazzup, Collecta.com all provide the ability to search Twitter (and in Collecta’s case, the entire Web) for real-time results related to a key word. For a more detailed search based on timeframe, location, hashtag, people, and sentiment, try search.twitter.com/advanced. Twitority: A based Twitter search engine solution that allows users to sort results by any, some, or a little authority. Tweefind: Provdes search results that appear in order of user rank. Twazzup: Like Twitter Search, Twazzup displays the tweets in chronological order based on your keywords. The results also reveal other potentially relevant keywords, events, and hashtags associated with the subject matter you’re researching based on the patterns of those who collectively share similar updates. Results also include a list of top trendmakers as well as related pictures, videos, and most popular links related to your search criteria. Twingly: Like Twitter Search, Twingly also provides results for other mainstream and niche microblogs such as Identica, Jaiku, Pownce archives, among others. Also see Blogsearch. Technorati: Considered the largest blog search engine in the world. Technorati tracks “blog reactions” (keywords) and blogs linking behavior. Blogsearch.google.com: Similar to News.Google.com, Google Blog Search allows users to comb through blog posts for relevant discussions and also to identify authorities on any given subject. Google alerts are also available for blog search results. Blogged.com: A community for identifying blogs and bloggers that cover particular topics from what’s popular to “the long tail.” Blogs are rated by the community as well as by blogged.com editors to provide a human perspective. Twingly: Provides “spam-free” search results of blogs discussing your keywords. Results can be sorted by Twingly rank (a vetted process of rating individual blogs), time, and language. Results include a link to the profile of the host blog. BackType: Usually blog comments do not appear in traditional or blog search results. BackType is a conversational search engine that indexes and connects millions of conversations from blogs, social networks and other social media so people can find, follow and share comments. BoardReader: Accurately find and display information within the Web’s forums and message boards. BoardTracker: A forum search engine, message tracking and instant alerts system designed to provide relevant information contained in forum threads. BuzzGain: A complete listening, influencer identification, relationship management and reporting solution, BuzzGain helps identify conversations containing keywords in blogs, media, and social networks and also the influential voices behind those conversations. Using the integrated research tools and reporting tools, users can also document and visualize trends, add commentary to results and publish customizable reports. It’s free during its public beta perios. HowSociable: Provides a free look into brand visibility metrics by allowing a user to enter a keyword, name, or phrase and identify the content transpiring in 22 networks. WhosTalking: WhosTalkin.com is a social media search tool that allows users to search for conversations surrounding important topics. It serves as a hub for search results on blogs, news networks, social networks, video networks, image networks, forums, and tags. FiltrBox: Real-time social media and web monitoring, Filtrbox monitors thousands of mainstream news outlets, blogs, and social media in once place. By consolidating results in one dashboard, users can eliminate redundant searches and alerts. Users can also import their Google Alerts to manage noise, remove duplicate results and consolidate disparate results feeds. Radian6: Radian6 is focused on building a complete monitoring and analysis solution for PR and advertising professionals so they can be the experts in social media. The Radian6 listening platform monitors the social web to uncover conversations related to specific brand on millions of blog posts, viral videos, reviews in forums, sharing of photos, twitter updates. It also provides the ability to analyze buzz about a company, products, issues, competitors, and outcomes of specific marketing campaigns and social media investments. Buzzmetrics: Delivers trusted brand metrics, meaningful consumer insights and real-time market intelligence to help clients apply the power of consumer-generated media (CGM) to their businesses. BuzzMetrics services and solutions uncover and integrate data-driven insights culled from nearly 100 million blogs, social networks, groups, boards and other CGM platforms. The services include brand monitoring, brand connections and customer relations, consumer insights, and brand campaign planning and measurement. Trackur: Online reputation monitoring and social media listening tools, Trackur scans hundreds of millions of web pages–including news, blogs, video, images, and forums—and reports any discoveries that match relevant keywords. Visible Technologies: Helps users listen to and learn what consumers are saying about their company/brand in the blogosphere and social media communities. It also fosters customer engagement by enabling users to effectively participate in these discussions by placing the right messages in front of the right audiences for a more direct connection. Sentiment Metrics: Sentiment Metrics social media measurement dashboard enables users to monitor and measure social media and gain actionable business intelligence to develop more targeted marketing, improve products and increase profits. TNS Cymfony: Provides expert interpretation of how corporate messages are picked up across traditional and social media sources, enabling the ability to measure results and discover trends that affect the bottom line. Whether the goal is to influence the brand perception during a new product release, marketing campaign or even through a crisis, TNS Cymfony’s market influence analysis tracks consumer preferences across traditional and social media sources and provides the ability for listeners to act and engage quickly to keep perception on track. BrandsEye: Traces and assesses online presences and provides real-time Reputation Score for both the user’s brand as well as their competitors. This allows companies to monitor the sentiments and opinions of their own customers, while making educated judgments about how to respond to attacks on their online reputation. Cision Social Media: Social media monitoring of over 100 million blogs, tens of thousands of online forums, over 450 leading rich media sites, along with a complete database of influential voices on the web and in social media. Techrigy: SM2 is a software solution designed specifically for PR and Marketing Agencies to monitor and measure social media. It works with the company’s Social Media Warehouse system that tracks blogs, wikis, message boards/forums, video/photo sites, mainstream media, blogs, microblogs, and social networks. Trendrr: Tracks the popularity and awareness of trends across a variety of inputs, ranging from social networks, to blog buzz and video views downloads, all in real time. SocialMention: A social media search platform that aggregates user-generated content from across the universe into a single stream of information. Thanks for the mention Brian and I completely agree. Knowing the influencers empowers one to pinpoint efforts to gain maximum returns and through our individual engagements. Something which may not be apparent from the BrandsEye website is that you can also pull lists of top brand communicators based on about 15 fully customisable criteria i.e. people talking negatively and with a high credibility and linking to your website and coming from a particular site (i.e. Twitter) etc. Thorough and insightful as always Brian! Thanks for including Trackur.com in your list of recommended tools!